Staying alert and focused as a driver is challenging when you’re driving by yourself. Having to deal with traffic, bad road conditions and weather are just a few of the distractions that drivers face. When you add kids to the equation it can take your focus off the road. 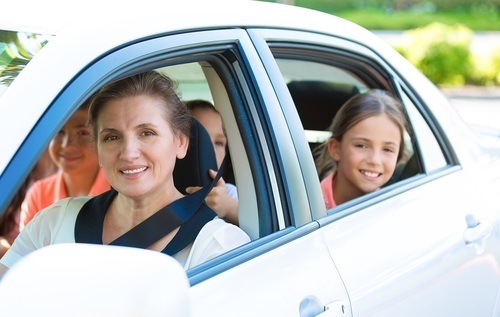 Keeping the kids focused on activities will allow you to focus on driving, which ultimately keeps everyone safe. Planning activities for your young passengers can be an easy task. The ease of electronically entertaining your children is one solution. Many parents are packing DVDs, iPods, and laptops for long trips, but there are children who need more interaction, and/or get tired of staring at a screen for several hours. A combination of activities, books (if your kids don’t get carsick), and a movie make for a better trip for everyone. Fun Road Trip Games (http://www.fun-roadtrip-games.info/) has age-appropriate activities, and great printable pages. Kids Can Travel (http://www.kidscantravel.com/familytraveltips/ontheroad/index.html) has great articles & tips for traveling with kids. Another thing to remember is kid-friendly snacks. Pack separate lunch bags for each kid with easy open packages (reusable baggies, small plastic containers, individually wrapped items). Bring snacks that have protein and whole grains – two essential nutrients that stay in bodies longer and keep blood sugar levels stable. They’ll help kids from getting overly hyper from excess refined carbs (peanut butter granola bars, fruit and nut trail mixes with yogurt covered raisons, and mini bagels with peanut butter are a few examples). In addition to bringing water bottles, I’ve packed juice boxes. Of course, don’t forget to bring napkins or wet wipes (you’ll use them). Making stops for kids to get out and stretch will help keep boredom to a minimum. Parks with playgrounds are ideal stops to get rid of that extra energy. You can look up tourist information for stops along your route online and pick a place to spend half an hour (kids’ museums, historical sites, nature trails are all fun places to check out). You can also make the kids their own maps and have them check off places along the way (to keep track of the trip’s progress). Getting to the destination is part of the fun on a road trip especially if you plan ahead. Not only will the kids have a positive traveling experience, but you’ll get to your destination safe and sound.